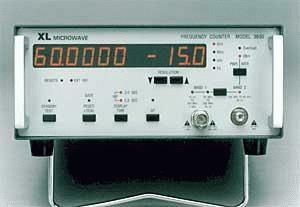 XL Microwave manufactures a number of CW (continuous wave) Microwave and Millimeter Wave Frequency counters (to 60 GHz, model dependent), with built-in Power Meter. These rugged light-weight instruments combine high-performance, reliability, durability, and small size. Frequency measurement extends from 10 Hz to the end of the model bandwidth and provides 0.01 Hz resolution of signals below 40 MHz. Simultaneous frequency and power measurements span 120 MHz (or 200 MHz) to the end of the model bandwidth using a single coax input…no wave-guides, external mixers, or power sensors required!